Genius Loci Games: Fifth Edition Fantasy Adventures on Sale! +Goodman Games' foray into the new frontiers of 5th edition became available today VIA RPGnow and other Onebookshelf sites. The two adventures run for $.699 each and together can take a party from 1st through 6th level. 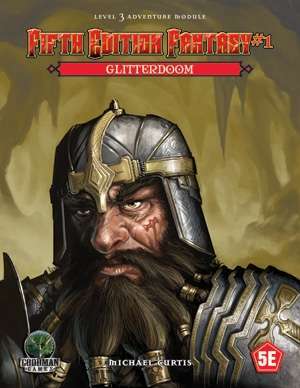 Glitterdoom is the first and shorter of the two but also the more traditional in style and story. 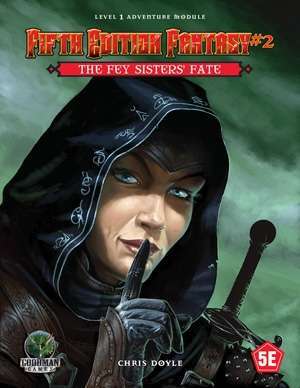 Fifth Edition Fantasy is here! This adventure module is fully compatible with the fifth edition of the world’s most popular fantasy RPG, and ready to play in your home campaign! The most interesting piece here for me is the new dwarven sub-race, the Sojourner which uses Intelligence as it's bonus ability. Of course the stone ghosts are pretty damn cool too! The Fey Sisters' Fate is the second one and as far as my quick scan shows the far more strange of the two offerings. This one I've only lightly looked over but is the fuller adventure and the one I think had the best prep time. The most important aspects of both adventures though has been the use of the OGL 1.0 at the beginning of the adventure and the stat block for creatures and magic items that remains unchanged from the actual 5e. As a bonus both adventures come with a code for RPGnow for a digital copy of the adventure. I think this was an accidentally addition by Goodman as it is obviously supposed to be a perk for those who bought the physical copy. Still just the knowledge of its inclusion makes me happy, as I believe this is the best way for print market to stay alive.